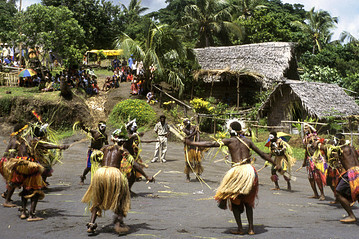 Dancers in 2006 celebrate the anniversary of the John Frum Movement cargo cult on the island of Tanna in the Vanuatu archipelago. Causes, beliefs, and practicesCargo cults are marked by a number of common characteristics, including a "myth-dream" that is a synthesis of indigenous and foreign elements; the expectation of help from the ancestors; charismatic leaders; and lastly, belief in the appearance of an abundance of goods. Symbols associated with Christianity and modern Western society tend to be incorporated into their rituals as magical artifacts, for example the use of cross-shaped grave markers. Notable examples of cargo cult activity include the setting up of mock airstrips, airports, offices, and dining rooms, as well as thefetishization and attempted construction of Western goods, such as radios made of coconuts and straw. Believers may stage "drills" and "marches" with sticks forrifles and use military-style insignia and national insignia painted on their bodies to make them look like soldiers, thereby treating the activities of Western military personnel as rituals to be performed for the purpose of attracting the cargo. ExamplesThe term cargo cult was first used in print in 1945 by Norris Mervyn Bird, repeating a derogatory description used by planters and businessmen in the Australian protectorate of Papua. The term was later adopted by anthropologists, and applied retroactively to movements in a much earlier era. First occurrencesDiscussions of cargo cults usually begin with a series of movements that occurred in the late nineteenth century and early twentieth century. The earliest recorded cargo cult was the Tuka Movement that began in Fiji in 1885 at the height of British colonial plantation era. Tuka was a leader who witnessed a loss of ancestral efficacy in his social group, a loss of land, and a loss of everything meaningful to his people. The movement began with a promised return to a golden age of ancestral potency. Minor alterations to priestly practices were undertaken to update them and attempt to recover some kind of ancestral efficacy. Colonial authorities saw Tuka as a rebel, and he was exiled, although he kept returning. Cargo cults occurred periodically in many parts of the island of New Guinea, including the Taro Cult in northern Papua New Guinea and the Vailala Madness that arose from 1919 to 1922. The last was documented by Francis Edgar Williams, one of the first anthropologists to conduct fieldwork in Papua New Guinea. Less dramatic cargo cults have appeared in western New Guinea as well, including the Asmat and Dani areas. Some Cargo Cults adopted traditional practices that use some aspects of military drills. Pacific cults of World War IIThe most widely known period of cargo cult activity occurred among the Melanesian islanders in the years during and after World War II. A small population of indigenous peoples observed, often right in front of their dwellings, the largest war ever fought by technologically advanced nations. First, the Japanesearrived with a great deal of supplies and later the Allied forces did likewise. The vast amounts of military equipment and supplies that both sides airdropped (or airlifted to airstrips) to troops on these islands meant drastic changes to the lifestyle of the islanders, many of whom had never seen outsiders before. Manufactured clothing, medicine, canned food, tents, weapons and other goods arrived in vast quantities for the soldiers, who often shared some of it with the islanders who were their guides and hosts. This was true of the Japanese Army as well, at least initially before relations deteriorated in most regions. The John Frum cult, one of the most widely reported and longest-lived, formed on the island of Tanna, Vanuatu. This cult started before the war, and only became a cargo cult afterwards. Cult members worship certain "Americans" (such as John Frum and Tom Navy), who they claimed had brought cargo to their island during World War II, as the spiritual entity who would provide the cargo to them in the future. Post-warWith the end of the war, the military abandoned the airbases and stopped dropping cargo. In response, charismatic individuals developed cults among remote Melanesian populations that promised to bestow on their followers deliveries of food, arms, Jeeps, etc. The cult leaders explained that the cargo would be gifts from their own ancestors, or other sources, as had occurred with the outsider armies. In attempts to get cargo to fall by parachute or land in planes or ships again, islanders imitated the same practices they had seen the soldiers, sailors, and airmen use. Cult behaviors usually involved mimicking the day to day activities and dress styles of US soldiers, such as performing parade ground drills with wooden or salvaged rifles. The islanders carved headphones from wood and wore them while sitting in fabricated control towers. They waved the landing signals while standing on the runways. They lit signal fires and torches to light up runways and lighthouses. In a form of sympathetic magic, many built life-size replicas of aeroplanes out of straw and cut new military-style landing strips out of the jungle, hoping to attract more aeroplanes. The cult members thought that the foreigners had some special connection to the deities and ancestors of the natives, who were the only beings powerful enough to produce such riches. Cargo cults are typically created by individual leaders, or big men in the Melanesian culture, and it is not at all clear if these leaders were sincere, or were simply running scams on gullible populations. The leaders typically held cult rituals well away from established towns and colonial authorities, thus making reliable information about these practices very difficult to acquire. The Prince Philip Movement on the island of Tanna, worships Prince Philip, Duke of Edinburgh, husband of Queen Elizabeth II. Peter Worsley(i)s analysis of Cargo cults placed the emphasis on the economic and political causes of these popular movements. He viewed them as "proto-national" movements by indigenous peoples seeking to resist colonial interventions. He observed a general trend away from millenarianism towards secular political organization through political parties and cooperatives. Theodore Schwartz was the first to emphasize that both Melanesians and Europeans place great value on the demonstration of wealth. "The two cultures met on the common ground of materialistic competitive striving for prestige through entrepreneurial achievement of wealth." Melanesians felt "relative deprivation" in their standard of living, and thus came to focus on cargo as an essential expression of their personhood and agency. Peter Lawrence was able to add greater historical depth to the study of cargo cults, and observed the striking continuity in the indigenous value systems from pre-cult times to the time of his study. Kenelm Burridge, in contrast, placed more emphasis on cultural change, and on the use of memories of myths to comprehend new realities, including the "secret" of European material possessions. His emphasis on cultural change follows from Worsley(i)s argument on the effects of capitalism; Burridge points out these movements were more common in coastal areas which faced greater intrusions from European colonizers. Cargoism: The discourse on cargo cultsMore recent work has debated the suitability of the term cargo cult arguing that it does not refer to an identifiable empirical reality, and that the emphasis on "cargo" says more about Western ideological bias than it does about the movements concerned. Nancy McDowell argues that the focus on cargo cult isolates the phenomena from the wider social and cultural field (such as politics and economics) that gives it meaning. She states that people experience change as dramatic and complete, rather than as gradual and evolutionary. This sense of a dramatic break is expressed through cargo cult ideology. Lamont Lindstrom takes this analysis one step farther through his examination of "cargoism", the discourse of the west about cargo cults. His analysis is concerned with our western fascination with the phenomenon in both academic and popular writing. A serious problem with the name is its pejorative connotation of backwardness, since it imputes a goal (cargo) obtained through the wrong means (cult); the actual goal is not so much obtaining material goods as creating and renewing social relationships under threat. Martha Kaplan thus argues we should erase the term altogether. Metaphorical uses of the termThe term "cargo cult" has been used metaphorically to describe an attempt to recreate successful outcomes by replicating circumstances associated with those outcomes, although those circumstances are either unrelated to the causes of outcomes or insufficient to produce them by themselves. In the former case, this is an instance of the post hoc ergo propter hoc fallacy. The metaphorical use of "cargo cult" was popularized by physicist Richard Feynman at a 1974 Caltech commencement speech, which later became a chapter in his book Surely You(i)re Joking, Mr. Feynman!, where he coined the phrase "cargo cult science" to describe activity that had some of the trappings of real science (such as publication in scientific journals) but lacked a basis in honest experimentation. Later the term cargo cult programming developed to describe computer software containing elements that are included because of successful utilization elsewhere, unnecessary for the task at hand. Novelist Chinua Achebe in his 1984 book The Trouble with Nigeria criticized what he called the "cargo cult mentality" of the rulers of many developing countrieswho issued lofty proclamations about the future of their countries but fail to exert the necessary effort to bring about those improvements. Economist Bryan Caplan has referred to Communism as "the largest cargo cult the world has ever seen", describing the economic strategy of the 20th-century Communist leaders as "mimicking a few random characteristics of advanced economies", such as the production of steel. American rock critic Robert Duncan used cargo cults as an organizing metaphor for the social dislocations in 1960-1970s America in his 1984 book, The Noise. The 2013 art theme of the week-long annual Burning Man festival held in the Black Rock Desert, Nevada is titled "Cargo Cult" and directly references the John Frum cult.